In the front row of Baltimore’s Charles Theater Sunday night, Harry Belafonte was smiling at his own recollection – and remembering. It was magic, courtesy of the 2011 Maryland Film Festival and Belafonte himself in bringing the stunning new documentary on his life to Baltimore as this year’s closing event. And in lining up early for the sold-out show (my wife Bonnie’s insistence), we found seats one row behind and four seats away from him. It was difficult at times to turn my eyes toward the screen when I could see the reflection of its light in Belafonte’s right eye, the occasional smile, or look of intensity at the passing of his 84 years – from his birth in New York, abandonment by his father and being sent by his mother to be raised by relatives in Jamaica, to a life in the forefront of America’s civil and human rights movements. 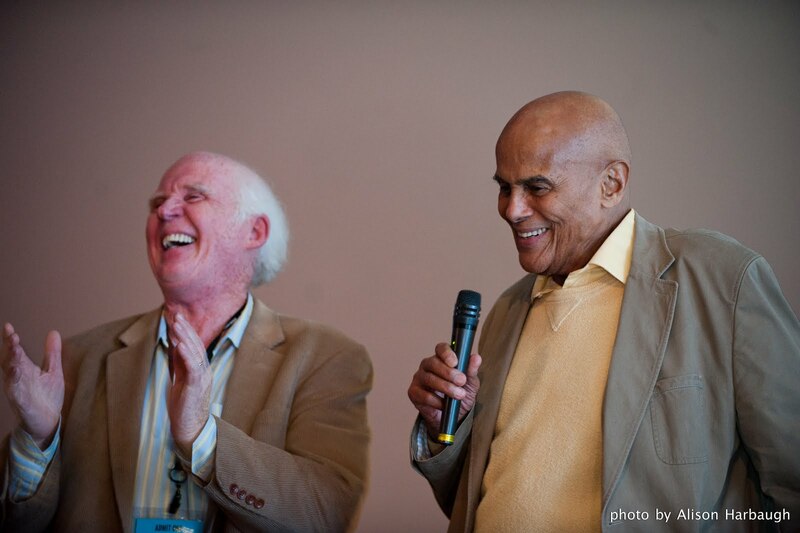 I knew little of his life story, yet Belafonte has always been part of my own life. Growing up in the 1950s, his was perhaps the first real black face I can remember from television. And there he was again, up on the big theater screen – singing on the Ed Sullivan Show, and in a prime-time Revlon-sponsored special. His music is part of this nation’s collective memory, like the “Banana Boat Song” (all right, call it “Day-O”). But what was not part of my memory was the uproar over his 1960s TV appearance with British singer Petula Clark, because she was touching his arm. Or his touring the country, including the South, in a show with the popular white dancers Marge and Gower Champion and enduring the frequent humiliations bestowed on traveling African-Americans at hotels, restaurants and restrooms. The focus of “Sing Your Song” is far less on Belafonte the performer, as on his use of the forum provided by his celebrity to address social ills here and across the world – work he is continuing through outreach to young people today. Sometimes, the road meant inspiring civil rights marchers in Alabama or Mississippi. Later, it was protesting war or Apartheid, or seeking ways to address famine killing uncountable thousands in Ethiopia (think the song “We Are the World”). There are moments in which he is questioning the civil rights views of presidential candidate John F. Kennedy, trying to influence the racial awareness of Bobby Kennedy, and of helping and befriending Martin Luther King Jr. And, curiously, there was his role in Barack Obama becoming... anything. Belafonte was among a group of celebrities whose support helped fund scholarships for Kenyan students to come study in America... one of them the young Barack Obama who fathered our current president. Still, Belafonte saw a parallel between the spark of hope ignited in young people by Obama’s campaign theme of “Yes, We Can,” and that of the spirit underlying the civil rights movement’s “We Shall Overcome” some two generations ago. Taking a few questions from the audience, Belafonte was asked whether there was anything in his life that he would change. The film -- produced by a team including younger daughter Gina Belafonte, and directed by Susanne Rostock – has been purchased by HBO. Film festival director Jed Dietz said the cable giant’s plans complicated efforts to bring “Sing Your Song” to Baltimore, but any problems were overcome through the local connection of historian Branch and cooperative push by Belafonte himself. He said he had initial misgivings about the film project, “concerned that my fame would get in the way of the message.” But he was assured otherwise by his daughter – and the film that resulted is enthralling. Belafonte noted that the documentary footage was culled from some 800 hours of film, and said he hopes that talks with HBO may lead to more exploration of that “treasure trove” for a series giving wider berth to some of the rich story lines. “It helps me remember,” he said. And was he watching from a first-person point of view, or third-person as does the audience? “I watch from many points of view,” he said. Not least of them, judging from his remarks in the theater, was the philosophical point of view of a man who seems to have learned from and grown with every moment of his 84 years.